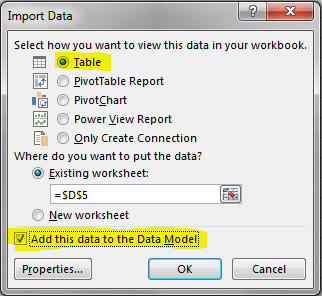 In a nutshell, Data Explorer is self-service ETL for the Excel power user – it is to SSIS what PowerPivot is to SSAS. In my opinion it is just as important as PowerPivot for Microsoft’s self-service BI strategy. There’s a lot to it, so download it and have a play! It’s supported on Excel 2013 and Excel 2010 SP1. Last summer I wrote a post about the new WebService() function in Excel 2013 and showed how it could be used to display data from the BBC Weather web service in a worksheet. I hadn’t thought about it much after that, but the other day I was working with a customer who wanted to work out how far people had to travel to visit a location and I wondered whether this was something that could be achieved with the WebService() function. It turns out that it can be – once you’ve worked around some of the quirks of WebService() – so I thought I’d post a couple of worked examples of how to use Bing Maps and Google Maps REST APIs to solve this kind of problem in Excel. You can download a sample workbook that contains both these examples, minus my Bing Maps API key, here. One final thing to mention is that the WebService() function seems to be horrendously slow, so you might not be able to use it to make a large number of calls very quickly, although many of these services allow you to make multiple lookups in a single API call. Also, remember that there’s usually a limit on the number of calls you can make to these APIs without paying. Impala is open source and isn’t shy about the debt it owes to Google’s Dremel, which of course is available publicly now as BigQuery. When I first saw BigQuery I thought putting an MDX interface over the top would make it appealing to a much wider audience – maybe not a good thing for Microsoft, but it would be a clever move on the part of Google certainly. Microsoft hasn’t announced that it’s working on anything comparable to BigQuery, alas; already, BI tools like Tableau and BIME can connect to and query BigQuery (Tableau also connects to Amazon’s new Redshift database too), and it’s these tools that are Excel’s big competitors in the BI client tool space. I guess SSAS 2012 Tabular in DirectQuery mode going against PDW would be the only vaguely similar Microsoft solution, but PDW is on-prem only and pretty expensive. 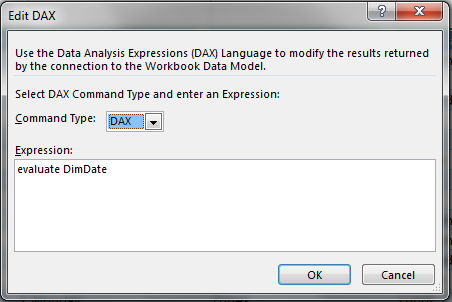 Translating MDX to the SQL used by tools like Impala, in the way that the Simba MDX Provider does, puts Excel on a more equal footing with Tableau et al. I don’t know how Simba/Cloudera will be making this MDX Provider available but I would be surprised if they didn’t charge for it; Microsoft’s close relationship with Hortonworks, a competitor to Cloudera, makes me think that Microsoft might not want to promote this particular tool either, which is a shame. Maybe an acceptable solution for MS would be to build new cartridges for SSAS 2012 and enable DirectQuery for data sources other than SQL Server? It’s unlikely to happen, I think, but it would be an option. Apart from all the public training courses I’m running in London this year, I’m also going to be running pre-conference seminars (as well as speaking) at SQL Server conferences outside the UK. The first of these will be at the DatabaseDays conference in Switzerland, which will be taking place at the Trafo Conference Centre in Baden, not far from Zurich, on the 17th-19th April. My pre-conference seminar will be a one-day Introduction to MDX, and other speakers at the conference include Jen Stirrup, Stacia Misner and various members of the SQLCat team; you can see the the full list of conference sessions here. I love visiting Switzerland (I lived there for a few years a while back) so I’m really looking forward to it! PivotTables are all well and good, but sometimes when you’re building reports you just want a plain old list of things. 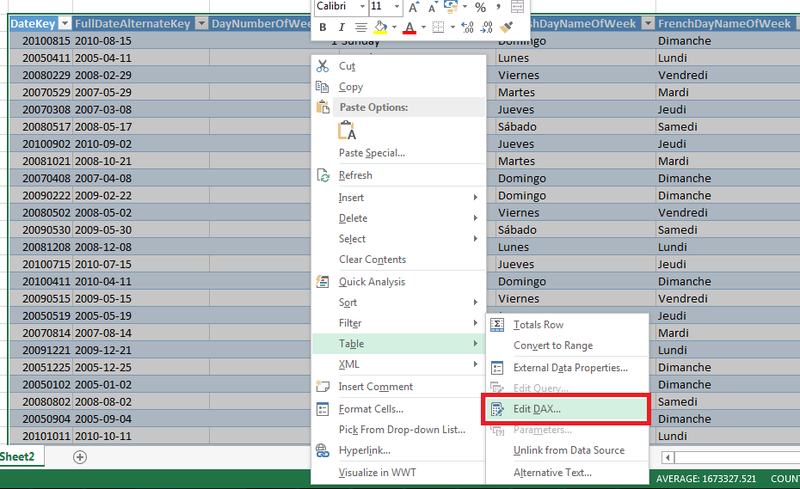 Excel tables are perfect for this, and in Excel 2013 you can bind a table to the results of a static DAX query against the Excel Data Model. Unfortunately it’s not possible to make this query dynamic without a bit of VBA – so in this post I’ll show you how to do it. Before I start, though, you may be thinking “What’s the point of this?”. After all, if you have too much data for the native Excel table functionality to handle, you can always use the Excel Data Model and make a PivotTable look just like a table, and when you do that you can use filters, slicers and so on to control what gets displayed. This is certainly a valid approach but the big disadvantage of a PivotTable is that it doesn’t always give you the best possible performance because of the way it generates its MDX, and because DAX queries are anyway faster than MDX queries for this kind of detail-level reporting. For large tables with lots of columns then a hand-rolled DAX query might give you significantly better performance than a PivotTable, as well as more control over the filtering logic. 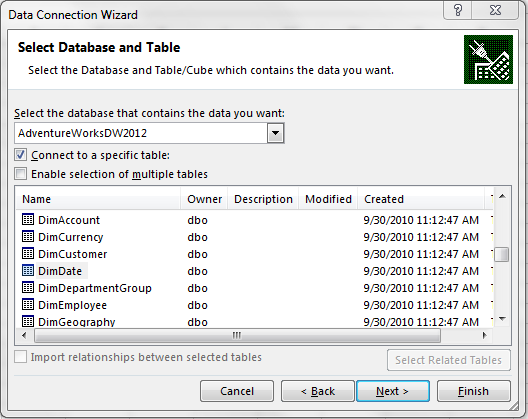 For my example, I have imported the DimDate table from the Adventure Works DW database in SQL Server into a table in Excel. …which returns the whole contents of the DimDate table, so in fact at this point the table looks exactly the same as it did before I made this change. 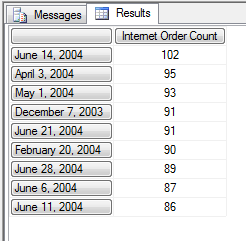 The challenge is now to take the selection in the slicer and the value entered for the day number of month filter and use that to construct a DAX query. 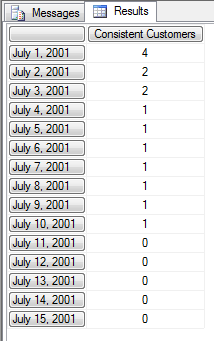 Here I’m filtering the DimDate table so that the only rows displayed are where day number of month is greater than 21, and day name of week is either Monday or Saturday. If you’re interested in learning more about writing DAX queries, check out the series of blog posts I wrote on this topic here. 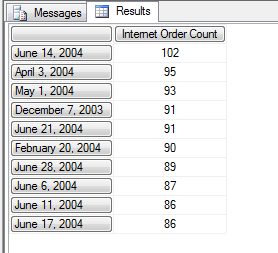 SelectedList = SelectedList & " || "
SelectedList = SelectedList & "DimDate[EnglishDayNameOfWeek]=""" & SI.Caption & """"
DAXQuery = DAXQuery & " && (" & SelectedList & ")) order by DimDate[DateKey]"
And so there we go, a dynamic DAX table report in Excel 2013. If you’d like to download my example and check it out in detail, you can get hold of it here. Pretty much everyone that knows MDX knows the TopCount() function, which is used to find the top n items in a set – it can be used for finding your top 10 products, your top 20 salespeople, and so on. However most people don’t consider it’s biggest drawback: it always returns n items, and doesn’t take ties into account. 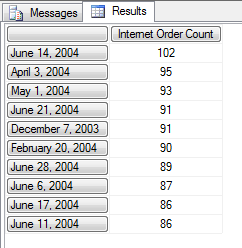 Notice how June 11 2004 and June 17 2004 both have the same Internet Order Count of 86, but the latter date isn’t included in the first query. From this you can see that it’s important, when you’re doing a top n query, not to always return n items but to take tied values into account. What I’m doing here is first using the TopCount() function to find the set of the top 9 dates (this step isn’t strictly necessary, but it has a significant positive impact on performance), and then using the Rank() function with the third parameter to find the tied rank. The Rank() function should find the position of a member in a set, but when the third parameter for it is specified it doesn’t match members based on the members themselves but on the values of the tuple specified in the third parameter. 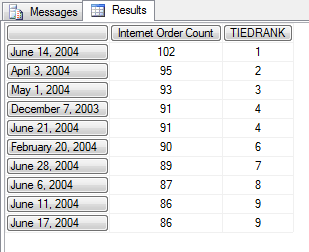 Hence, even when I have a date that doesn’t appear in the set TOP9, the Rank() function can still return a value for it if that date has a value for Internet Order Count that does appear in that set.